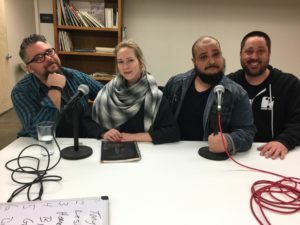 Episode 127 features Chris Emery, Tessa Brown, and Ruben Acosta competing to assemble the Top 10 List of Best Television Characters of all time. We had to re-record this episode because I screwed up the first recording from our live version of the show at the Comedy Spot. Up side: Some people get to hear two versions of the same episode. This was a fun episode to record. Remember, drink when I name drop or screw up the spelling of someone’s name. Stop reading! Start listening!